Under 16 Boysarrow-rightCreated with Sketch. The Driffield Under 16 boys travelled to Wakefield Hockey Club on Sunday afternoon for their play-off finals tournament, eager to prove their development over the course of the year and finish the 2018-2019 season on a positive note. The positivity and determination were evident in their first game against Sheffield, where Driffield dominated the early phases of the game. Forwards Charles Porter, George Morgan and Oli Needham pressured Sheffield in their own half and midfielders Tyler Grice, George Walster and co-Captain George Martindale stood firm in the face of Sheffield’s occasional forays forward. Indeed, their tenacity eventually proved too much for the South Yorkshire side and a phenomenal mazing run and well-struck shot from Martindale found Morgan’s stick in front of the Sheffield Goalkeeper, the ball deflecting spectacularly into the top-left corner of the goal. Unfortunately, this lead proved to be a temporary one as the Sheffield team responded by upping their game, playing some effective counter-attacking hockey that caught Driffield off guard and culminated in 3 quick goals. Despite the 2-goal deficit, Driffield fought hard to the final whistle, leaving the pitch disappointed that their hard work and superior gameplay failed to deliver the result they deserved. Determined to right the wrongs of the last game, the young Woldsmen next faced Harrogate, whose impressive season had finished in frustration as they were pipped to the league title by rivals Wakefield. Again, the Driffield team piled the pressure on their opponents in the early phases, and many of the Harrogate team’s attacks were equalled by the Driffield back line of co-Captains Fin Needham & Callum Morley, Callum Seers, Devlin Hunt and Harry Chacksfield. Nevertheless, Harrogate pressed hard, moved well off the ball, and dominated possession. With the Driffield squad fatiguing fast, the result seemed inevitable; 6 Harrogate goals later the young Driffield team were painfully reminded that Hockey is a momentum game. The 12-man squad went into their final game against Doncaster after a much-needed rest with a renewed positivity; with nothing to lose, they could leave everything they had left in the tank on the pitch. Driffield looked eager to get some consolation in this last game, working the ball well from the back through the midfield and into the forward line, keeping possession for long periods, and showing their skills to beat players in 1-on-1 situations. In spite of this, the well-organised and skilful Doncaster team were equal to their best efforts, and the tired and undermanned Driffield were once again subjected to clever and effective counter-attacking play. Even the impressive work of goalkeeper Bryan Usher could not deny 3 excellent Doncaster goals, and Driffield were unable to muster a response before the final whistle. In the face of this disappointment, Driffield walked off the pitch smiling in the knowledge that each player had given their best effort to the team. 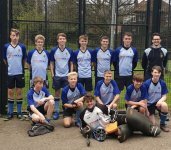 As co-captain Callum Morley remarked in the debrief, the day had seen some of the best hockey that the young Woldsmen had played all season, and a complete and fully-fit Driffield team would have undoubtedly had a greater impact on the tournament. Coach Danny Bell could not have been prouder of the attitude and effort shown by the squad in the play-offs, and indeed throughout the season; finishing in the league’s top 8 amongst some of the biggest clubs in Yorkshire is a testament to their dedication, determination and improvement. Special thanks to kit sponsors Yorkwold Pig Pro for the season’s support, to Sheena Martindale for all her support as team manager, and to the parents who have given up their Sundays throughout the season in support of the team.